When it comes to parenting choices, us crunchy mamas don’t accept the status quo. We research, read, and dig through mountains of information to make “informed decisions”, desiring to give our children only the best. Being informed often has us making choices that aren’t mainstream so, we feel the target on our backs. Sometimes we’re a little defensive. We know the threat that looms over our heads should some “professional” disagree with an alternative choice, even when that choice is clearly not harming our child. Consequently, crunchy mamas tend to be leary of sharing anymore then we have to with sources that could potentially jeopardize our ability to parent our precious little ones in the ways we know are best. That innate trust in our ability to properly care for our children is the most natural, normal response to becoming a parent. There is some kind of change that takes place within a person, especially in mothers, that takes us from self-centered to child-centered the moment we see the positive on our pregnancy test. This natural ability to care for our children runs counter to our culture’s expectations. For generations we’ve been told that we “couldn’t possibly do that without the help of this ‘professional’”. We couldn’t possibly have a healthy pregnancy without poking and prodding and tests. We couldn’t possibly have a successful labour and delivery without being IVed, drugged, and in the hospital under constant, invasive monitoring. We couldn’t possibly have healthy babies without injecting them with CDC approved vaccines. We couldn’t possibly know when our children are ready to eat and what they should ingest without the help of the FDA and, the list goes on. If we listened to the culture, we’d believe we were the dumbest, most incapable creatures on the planet. Thankfully, we crunchy mama’s have reclaimed our children from pregnancy to kindergarten. However, when our children hit school age too many of us stop trusting our innate, natural, normal inner knowledge and pass our children off to be lead by the “professionals”. This is not a plug for home education, though, I do home educate and would encourage you, the reader, to at least consider the option. This post is about the confidence we crunchy mom’s feel in our ability to parent which almost dissipates like a night fog in the morning sun when our children hit the magical age of 5. The loudest voice of “you couldn’t possibly know what’s best without these professionals” is coming from the educational system and that voice is about to get belligerent. In 2014 Common Core State Standards are going to outright, boldface tell you that, “The Government knows best”. Through measures untold, that have been silently and deceptively changing laws and regulations in small methodical movements (so small that we’ve not even noticed them), we are about to be forced to give up our children to the all knowing federal government’s direction in their lives. The aim and goal of CCSS is to track your children from P-20W. That “P” stands for “pre-school”. “Pre-school” here means birth to K (shiver). The “-20” is database tracking from birth up through secondary and postsecondary education right on up to the “W” for “Work force”. So, from birth through the end of your child’s schooling experience, the government will be collecting some 400+ points of data like, but not limited to: Your child’s Social Security number, name, nicknames, bus schedule, family religion, parent’s voting affiliation, whether or not your child is able to work with others, your child’s willingness to conform, behavioral and psychological issues (you know, the ones the “professionals” diagnose), biometric information, and the list, that has little to nothing to do with bettering their educational experience, goes on. CCSS makes no secret that the data collection has nothing to do with bettering their education. It is for the expressed purpose of “career readiness”. Careers the Government thinks are best suited to your child. This data collection has been made possible through the Statewide Longitudinal Data System that every state in the country has adopted to one degree or another. Find out to what extent your state is “pipelined” here. In order to adopt this data collecting system the states had to agree to share data. Your children’s data doesn’t stay within the school walls. It goes out to the SLDS which is accessible by outside “Stakeholders” otherwise known as, the federal government. For further study on CCSS database collection, Christel Swasey of “Common Core: Education without Representation” has an extensive fact summary worth viewing. This aspect of Common Core is, by far, the sketchiest part of CCSS (in this crunchy mama’s opinion) but, it is not the only area of concern. 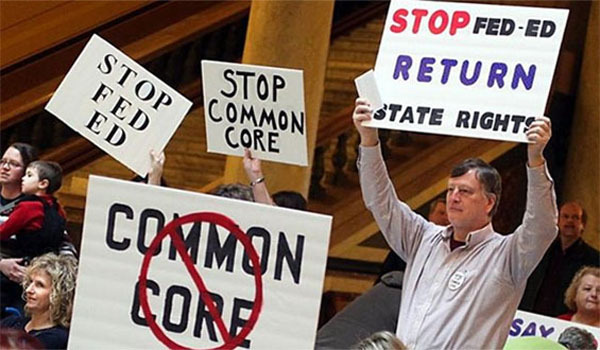 Common Core is the realization of the “plans” written out to Hilary Clinton by Marc Tucker in his 1992 letter known as the “Dear Hilary” letter. If you get a chance to read the letter for yourself, I want you to notice that job placement and training in the goal and the educational system is the vehicle. For those of you who do home educate, don’t breathe a sigh of relief. There are ways that the home educator will immediately be impacted and, over the long run, the nature of this beast is not freedom. The door of CCSS is already open. There is a very narrow window of opportunity happening, right now, to shut it. If we fail to do so, the face of America will be forever altered. The shift will take us from the natural path of “parents know best” to the unstoppable, unnatural, overreaching “Government knows best” in a way that is every crunchy mama’s nightmare. I highly recommend that the crunchy community do what we do best- get informed. I feel confident that, once informed, you’ll join whatever fight is happening in your state to throw out this rotten Core. I'm a Christian, wife to one wonderfully supportive man, SAHM to 3 crazy monkeys who I home educate. I'm passionately political. I am generally bent toward living naturally but, like all of us, I'm on the journey- I haven't quite "arrived" yet. I hope, as I share my crunch, you'll feel encouraged in your journey.